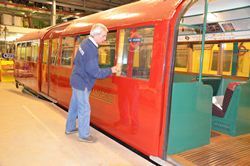 The more observant amongst you will have noticed that the restoration of Metropolitan Railway carriage no. 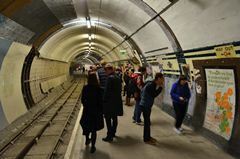 353 by the Museum has been one of the highlights of the Underground 150 celebrations. 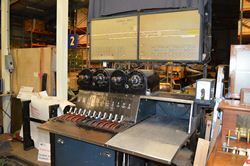 Dating from 1892, 353 has been the centrepiece of the show, and has appeared a number of times on the recent steam runs on the Underground. 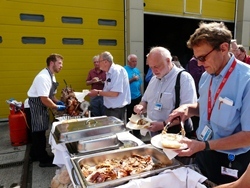 Late in May came the ‘Steam on the Met’ event (if you missed it there’s another similar run in September! 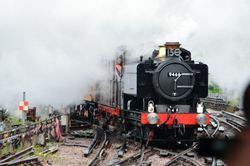 ), giving the opportunity for members of the public to ride behind a steam loco on the main line in a variety of old rolling stock, hauled by a steam engine. A British Rail 0-6-0 pannier tank built in the early 1950s, 9466, did the honours. No. 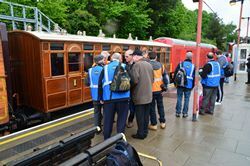 353 formed part of the train, and museum volunteers were fully involved with Underground staff in stewarding the event and making sure that all passed off well for the customers. Electric loco ‘Sarah Siddons’ and diesel 20 189 in its London Transport red livery were also in the train – no way were we going to be allowed to breakdown and block the line! Your humble scribe was pressed into action as a steward, and very enjoyable it was too. A freezing cold day found me joining the team at Harrow-on-the-Hill station for a full briefing prior to doing two round trips to Amersham. After joining the train our customers got on as well, and we were treated to a surprisingly fast run out to Amersham. 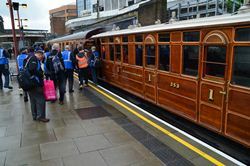 The atmosphere in the carriage was wonderful, with steam pouring past the windows, the Victorian ambience and the shared enjoyment of travelling first class in deep red plush seats on the Metropolitan Line. Everything passed off smoothly, other than the cold, wet weather: time was kept, and all passengers thoroughly enjoyed themselves. 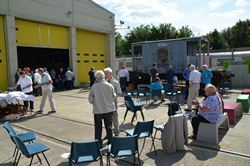 They also had the opportunity to chat about the history of 353 with the volunteers, who had received background notes from Dave Taylor (volunteer). Between the two trips we had a chance to retire to a pub in Harrow for a very late lunch, which was very welcome; strictly no alcohol though. 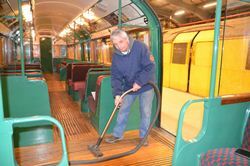 353 will be out and about quite a bit in 2013, and not just on London Underground lines, so there will be a chance to sample its delights at a number of different heritage railway events. Keep a lookout on the Museum’s Vehicles on the Move page! Our volunteers at the museum regularly put their shoulders to the wheel to help make sure that our visitors have a memorable experience. 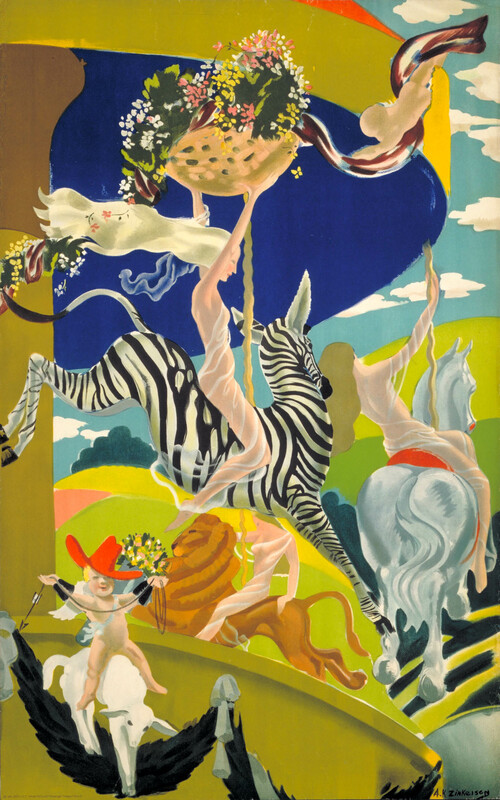 One of those experience s in ‘Object handling’ which is always popular – an opportunity to play with stuff, hands on. These sessions often have a bus theme, and on the day that I called in the guys were in full swing with fare tables, caps and various ticket machines. For someone of – ahem – my vintage, it can come as a bit of shock to realise that bus conductors will be a distant memory for anyone under the age of ten, and probably unknown to those under eight. So it’s no longer safe to assume that our younger guests have any conception of why there were conductors and what they got up to. A significant part of the experience is therefore an initiation into the daily work of the ladies and gentlemen collecting fares on the RT, trolleybus or tram. I found volunteers Peter Brown, John Campbell and Joe Ross accepting this challenge. As you can see, our heroic trio were under various states of siege on the day, and not just from the younger patrons. The desire to handle a Gibson ticket machine obviously runs deep in the population at large, so it’s just as well that there were two to hand on the stall. I’m not ashamed to admit (well not much) that I had a go myself with one, and you’d be surprised by just how heavy they are. Joe is the novice of the team, having some 3 months under his belt as a volunteer, but he was in safe hands with the experienced pair of John and Peter. Both have volunteered for a number of years, and been involved in many activities to support the work of the museum. 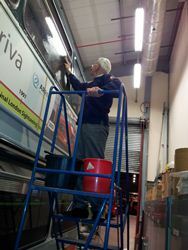 Peter is also active with the London Bus Museum at Brooklands, so I think we can safely say that he has the bug badly. You can also see in the accompanying photos two trainee conductors I met, Uma and Niyam Shah – I think a couple of weeks at the Chiswick training school and they’ll be ready to apply to the Traffic Commissioners for their badges. I can’t help but think that Uma might have the edge on her brother if they find themselves on the 15. And hurry up, it’s my turn with the cap……. I arrived at Aldwych on another bitterly cold Friday in good time for the final briefing and safety check; as a disused station is not maintained as a public environment, so every eventuality has to be anticipated and planned for. Arrival of the first public visitors immediately confirmed the great enjoyment these visits give people: a row of 40 smiling faces, drinking in the sight and ambience of the station booking hall (and probably also warming up, truth be told). 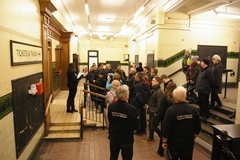 First things first, the visitors have to be fully safety-briefed before being given an overview of the station’s history by their volunteer tour guide. Then, in line with the standard pattern of the tour, a couple of minutes for personal exploration and photos before moving to the next site – which involves descending 161 stairs to the lower level of the station. Keeping to time is a major consideration: there are a number of tours on a given day, and these are tightly timed to a length of 45 minutes so as to offer as many tours as possible to the public. Next it’s the lower lift landings, followed by the two platforms. 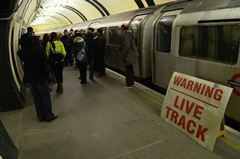 The western one was in public use until closure of the station in 1994, and was complete with a train of 1972 Northern Line stock. From there it’s smartly over to the eastern platform (decommissioned in 1914) all the while watching for trip hazards. This platform features a stretch of track laid in 1907. Note how there’s no suicide pit, a 1920’s innovation. 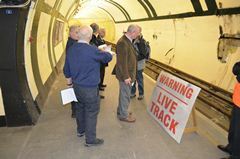 Throughout the benefit of the careful preparation by the volunteers pays off, not just in their set pieces but in answering the many questions, covering every conceivable aspect of the station and much else about the underground system. Finally, all photos taken and every question answered, we set off for the surface again, up the 161 steps (being so many, one is apt to count!). 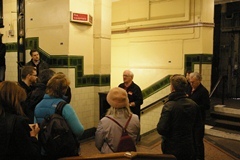 Every year the London Transport Museum with the help of Transport for London runs a short programme of public tours of the disused Underground station at Aldwych. Originally opened as Strand station in 1907, it closed in 1994, never having achieved the passenger numbers expected. Of the entire facility as originally constructed, about one third of it was never commissioned at opening in 1907, and roughly another third closed as an economy measure in 1914. So for the largest part of its life it was 2/3rds shut. Its sleepy life at the end of a short branch line ensured a lack of investment and refurbishment, as a result of which it’s as good a remnant of the original Edwardian tube as one could hope to find anywhere. Consequently it’s a grade 2 listed monument. 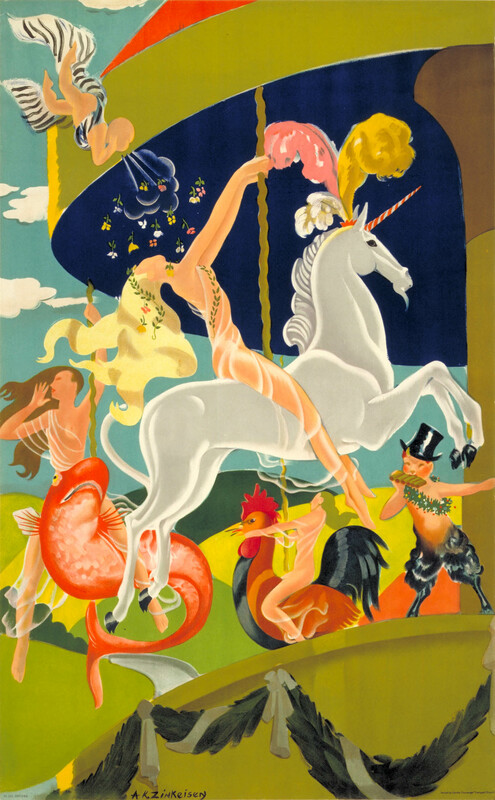 Hence the limited annual opening is a great draw – this year it was sold out on the day that tickets were made available. 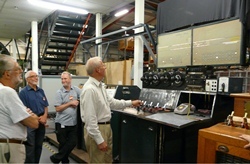 As you can imagine, opening a closed Underground facility to the public is a major undertaking, so all visitors are guided by museum volunteers. On a cold Friday morning I found myself joining a small group of volunteers planning for the event. 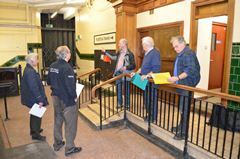 Despite its relatively short life the station has a rich history, and it’s a challenge to do it justice in a 45 minute tour. Just to confuse, some of the features that appear historical are misleading, thanks to the use of the station as a set for films. There’s an example in the photos with this post: can you spot it? 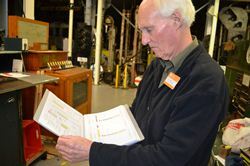 We spent a couple of hours checking the tour plan and verifying the contents of the guides’ notes. These are researched and scripted by the volunteers themselves, and evidenced a fund of knowledge of lesser known facts. Inevitably the station’s role as a shelter for both people and the nation’s heritage during both world wars featured large. By lunch all the loose ends had been tied down and we were tour ready. Let’s hope there’s no tricky questions! 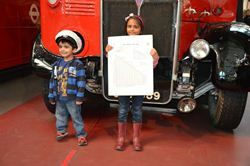 School half term is a great British institution, and as we all know no half term holiday is complete without a visit to London Transport Museum. 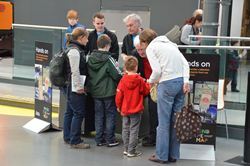 So half term always produces a spike in visitor numbers, and the museum’s volunteers put their shoulders to the wheel to help maximise the activities on offer. So on Thursday 1st October 2012 in the galleries of the museum I found Ash Ketchum preparing the object handling stall in anticipation of the rush, and she was soon joined by Ken Richards. The stall had a bus theme and was designed around bus ticketing through the ages. Ash has been fanatical about London buses since she was a young child, and has a family history around public transport in South East London. 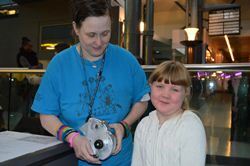 She has only been a volunteer with the museum since August 2012, so very much a new recruit. 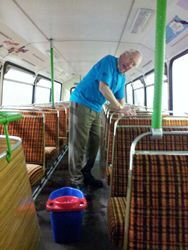 On the other hand, Ken has been a volunteer since 1998, originally joining up when he saw an appeal for volunteer guides in ‘On the Move’, the Underground staff magazine at the time; Ken was a Booking Clerk prior to retirement. 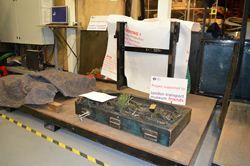 Since then he has been involved in a range of activities, most recently delivering the ‘Finding the way’ object handling theme. Later in the day came the rush – inevitably youngsters can’t resist the opportunity to produce a ticket for themselves and try on a hat. 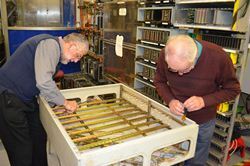 Ash and Ken were kept very busy – all I can say is that I hope that the museum has a very large cache of old tickets for future use. Two young visitors fascinated by the stall were Tatyana De Freitas (above) and Frankie Newman Smith (below), both shown here getting stuck in. 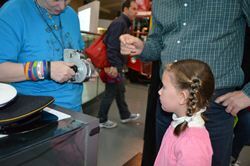 Frankie has London Transport history in her family, so perhaps a volunteer in the making..?